Families also came from abroad to celebrate with their children in Mokani Village and witness their participation at one of the important dates in the Methodist calendar. Known as the “triumphant entry,” or “Palm Sunday”, it was celebrated at most Christian churches in Fiji yesterday. 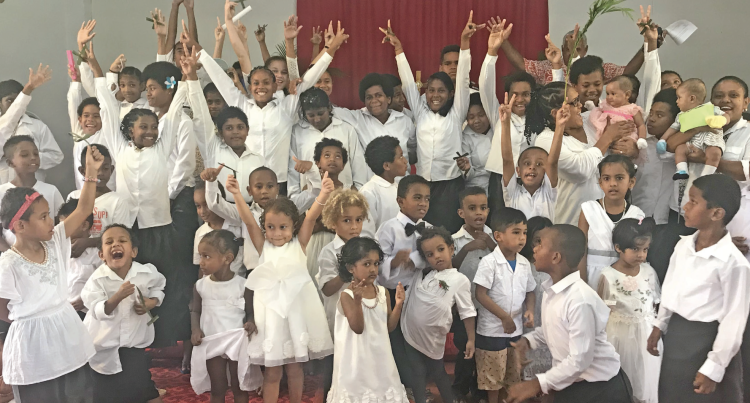 At Mokani Methodist Church in Tailevu, more than 100 children took part in singing, drama, preaching and other items leading all the church service sessions. The children had been practising their items for the past two weeks with the help of eight Sunday School teachers. Linda Vesitawale, a Sunday School teacher, thanked the parents and children for organising the event. With the theme “Spiritual upbringing of youths, Use of Information technology and Substance abuse”, Ms Vesitawale said it helped their children share and discuss the issues of drugs and challenges of new technologies and the solutions to the problems caused. Also commenting on the theme, Camare Delai, a parent, said that it was an eye opener for most of the parents. “We should have more family time with our children and supervise them on the use of new technologies”. She added that children are precious gift from God and “we should stop child abuse and negligence”.